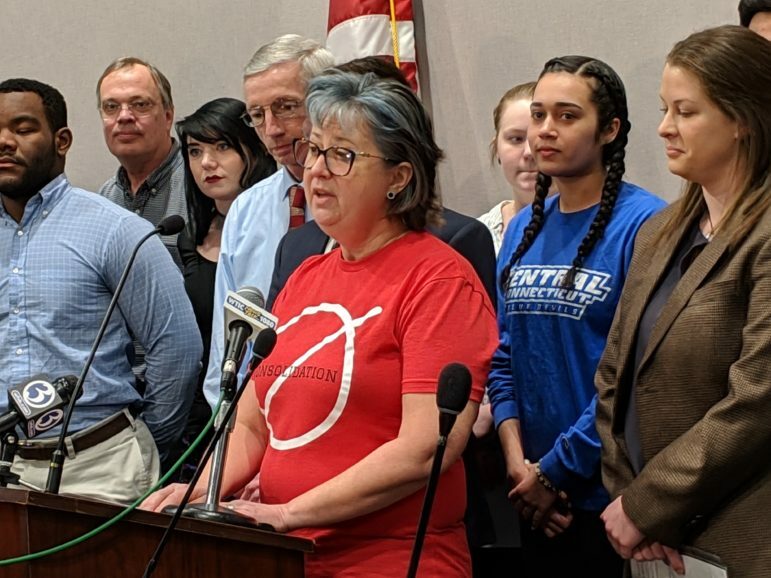 Elle Van Dermark, a faculty member at Asnuntuck Community College, said spoke out last week against the proposed consolidation of the state’s 12 community colleges. Connecticut’s ship of state was tossed left and right last week as the governor, lawmakers and members of the public tried to navigate through the strong economic headwinds opposing their progress. At a time when the state is facing huge multi-year budget deficits, Gov. Ned Lamont and members of the Democratic Party’s more progressive wing continued to be at odds over raising the state minimum wage, yet they were in agreement on the benefit to setting up a public option for health insurance. Lamont, who sees himself as a small-business person, said he is generally in favor of a health insurance public option. Legislators have two similar proposals in the works that would serve nonprofits and companies with fewer than 50 employees. The governor’s overall posture on spending state money is getting plenty of pushback. 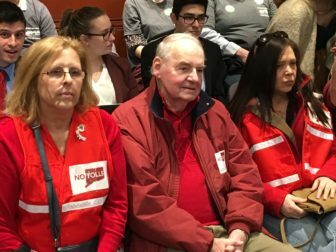 The new Lamont “debt diet” may cost the nonprofit social services network about $25 million from one grant as the governor tries to reduce Connecticut’s bonded debt. The progressives will also be advocating for higher taxes on the wealthy as opposed to Lamont’s more regressive plan to expand the sales tax. It remains to be seen how the Greenwich millionaire will react to their ideas. The governor is also tacking into the wind on the matter of highway tolls. In the face of some determined and organized opposition, he and his administrators began detailing their plan last week, but didn’t appear to win any new hearts or minds. Lamont is also pitching the prospect of a public-private partnership that would presumably use private investment instead of state money to finance the toll system infrastructure construction. A more immediate problem for Lamont is his nomination of former Goldman Sachs executive David Lehman as his commissioner of economic and community development, a man he defends against criticism that he helped engineer the collapse of the economy in 2008. The long range plan to consolidate the Connecticut State College and Universities’ 12 community colleges – a necessary step to save millions of dollars, CSCU President Mark Ojakian says — is whipping up plenty of immediate concern among students, faculty and former administrators. Friday dozens of opponents of the consolidation marched a 1,300-signature petition into Lamont’s office, demanding he get involved. College officials, meanwhile, laid out their budgets to the legislature, warning that the current flat funding plan only gives them what University of Connecticut President Susan Herbst described as the same amount of money as they got in 2008. Shortfalls will have to be made up with a combination of tuition increases, budget cuts and drawdowns of reserves, Ojakian said. Equally awkward for the Democrats was the sudden need to take a vote opposing “anti-Semitism, Islamophobia, racism and other forms of bigotry.” It was a reaction to remarks by Minnesota freshman Rep. Ilhan Omar about Israel — creating an uproar that threatened to overshadow the party’s passage of HR 1, centerpiece legislation focused on getting big money out of politics. Members of Connecticut’s delegation were also pursuing more mundane issues – like the Pentagon’s plan to reduce the number of F-35 jet fighters powered by Pratt & Whitney engines – and some equally politically hot ones, including the pursuit of President Donald Trump’s tax returns.